In order for network slicing to deliver on its promise as an effective tool to generate new revenues and profitability, new business models must match the dynamic technical and operational changes that it brings. Significant progress is being made in demonstrations and trials, as highlighted in this report and the accompanying RCR Wireless Webinar with Strategy Analytics, InterDigital and BT, yet more remains to be done. What should operators and vendors do in 2018 to prepare for network slicing as they move toward commercial 5G deployments? Strategy Analytics and thought leaders from InterDigital, Intel and operator participant BT outline a call to action to advance dynamic E2E 5G network slicing and ensure it delivers on the promise of 5G. 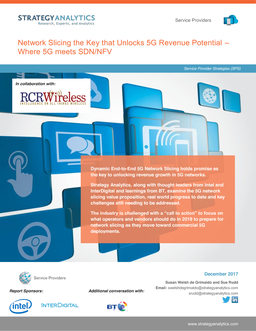 Service Providers www.strategyanalytics.com December 2017 Susan Welsh de Grimaldo and Sue Rudd Email: swelshdegrimaldo@strategyanalytics.com srudd@strategyanalytics.com Dynamic End-to-End 5G Network Slicing holds promise as the key to unlocking revenue growth in 5G networks. Strategy Analytics, along with thought leaders from Intel and InterDigital and learnings from BT, examine the 5G network slicing value proposition, real world progress to date and key challenges still needing to be addressed. The industry is challenged with a “call to action” to focus on what operators and vendors should do in 2018 to prepare for network slicing as they move toward commercial 5G deployments. Service Provider Strategies (SPS) Network Slicing the Key that Unlocks 5G Revenue Potential – Where 5G meets SDN/NFV Report Sponsors: In collaboration with: Additional conversation with: Service Providers Copyright © Strategy Analytics 2017 | www.strategyanalytics.com 2 of 19 Contents Executive Summary 3 1. Business Issues: Is Slicing the Key to 5G Promise? 4 1.1 The Promise of Network Slicing to Drive New Revenue Streams Efficiently 4 1.1.1 Network slicing Is all about the services 4 1.1.2 How many slices will be needed in a typical network? 5 1.1.3 What is the value proposition for services of dynamic end-to-end network slicing in 5G? 6 1.1.4 Is network slicing really the key to new 5G revenue and justify network investments? 7 1.2 Business Benefits beyond Revenue Generation: Slicing Promises Much More 8 2. State of Pre-5G Network Slicing 9 2.1 Industry PoCs and Trials for Network Slicing 9 2.2 Service Provider Examples 10 3. Technical and Operational Challenges to Fulfil the Promise of Network Slicing 13 4. A Call to Action and Key Questions to Assess 15 4.1 A Call to Action 15 4.2 Key Questions 16 5. About the Sponsors 17 5.1 5G End-to-End: What Intel Brings to the Table for Dynamic Slicing 17 5.2 InterDigital: Developing Key Standards, Building Blocks for 5G Network Slicing 18 6. How Can We Help You? 19 Service Providers Copyright © Strategy Analytics 2017 | www.strategyanalytics.com 3 of 19 Executive Summary Dynamic End-to-End 5G Network Slicing holds promise as the key to unlocking revenue growth in 5G networks. 5G is not only the next generation platform for future innovation but also a service enablement platform for engaging verticals and enhancing mobile broadband for consumers. 5G is about business transformation and new business models for Communications Service Providers (CSPs). Network slicing is a mechanism that will allow CSPs to dynamically allocate network resources in ways that will maximize customer value and enhance differentiated services, so that 5G can serve new purposes, adapt to specific needs and drive revenue opportunities. Network slicing allows CSPs to “segment one big broadband network into multiple virtual networks to serve verticals and applications in a more cost efficient manner”, as described in by 5G Americas. Slicing separates the network based on services; and the reason to create slices is to serve diverse business purposes with different Class or Quality of Service (Cos/QoS). With dynamic E2E network slicing, the industry can begin to move to a model where services expand and contract their use of network resources as traffic demands. 5G network slicing is expected to deliver service agility, enhanced security, and “just fit” services for enterprises, among many other service specific benefits. In particular, network slicing will enable CSPs to offer Network as a Service (NaaS), with new MVNO or partner models for verticals and specific segments/use cases. In order for network slicing to deliver on its promise as an effective tool to generate new revenues and profitability, new business models must match the dynamic technical and operational changes that it brings. Significant progress is being made in demonstrations and trials, as highlighted in this report and the accompanying RCR Wireless Webinar with Strategy Analytics, InterDigital and BT, yet more remains to be done. What should operators and vendors do in 2018 to prepare for network slicing as they move toward commercial 5G deployments? Strategy Analytics and thought leaders from InterDigital, Intel and operator participant BT outline a call to action to advance dynamic E2E 5G network slicing and ensure it delivers on the promise of 5G. “At the end of the day, we need to make sure that the costs of operating these multiple virtual networks doesn’t exceed the additional revenues we are expecting to get from those services” Maria Cuevas, BT Service Providers Copyright © Strategy Analytics 2017 | www.strategyanalytics.com 4 of 19 1. Business Issues: Is Slicing the Key to 5G Promise? 1.1 The Promise of Network Slicing to Drive New Revenue Streams Efficiently 1.1.1 Network slicing is all about the services While the industry has not fully fleshed out the functionality of network slicing, it is a network architecture that allows service providers to create multiple logical networks that can be assigned to different services/service types running over a common physical infrastructure, explains Maria Cuevas, Head of Mobile Core Network Research, BT. Network slicing “segments one big broadband network into multiple virtual networks to serve verticals and applications in a more cost efficient manner”, as described in a 5G Americas whitepaper “Network Slicing for 5G Networks & Services.” In an RCR Wireless Webinar with Strategy Analytics, Akbar Rahman, Sr. Principal Engineer, InterDigital, explains that 5G slicing offers richer functionality to address business needs than existing VLAN, VPN, QoS and virtualization approaches that aim to meet many of the same needs on today’s networks. The vision for dynamic, End-to-End (E2E) Network Slicing in 5G involves allocating a customized virtual slice of computing, storage and networking resources at an E2E IP network level for given users (tenants). A November 2017 GSMA report, “An Introduction to Network Slicing,” defines network slicing from the mobile operator’s point of view – “a network slice is an independent end-to-end logical network that runs on a shared physical infrastructure, capable of providing a negotiated service quality. The technology enabling network slicing is transparent to business customers.” The most recent September 2017 3GPP 5G Service Requirements (3GPP TS 22.261 V15.2.0 Release 15 Stage 1) are designed to allow “the operator to provide customized networks. For example, there can be different requirements on functionality (e.g., priority, charging, policy control, security, and mobility), differences in performance requirements (e.g., latency, mobility, availability, reliability and data rates), or they can serve only specific users (e.g., MPS users, Public Safety users, corporate customers, roamers, or hosting an MVNO).” And 3GPP explicitly notes that “A network slice can provide the functionality of a complete network, including radio access network functions and core network functions (e.g., potentially from different vendors). One network can support one or several network slices.” Initial provisioning of network slices for a variety of service types is relatively static with one or more service flows sharing a dedicated slice for their particular class of service, and each service flow being assigned to a particular network slice as needed. Going forward the goal is to make the process more dynamic with resources being assigned as required in real time. Service Providers Copyright © Strategy Analytics 2017 | www.strategyanalytics.com 5 of 19 Exhibit A. Dynamic Network Slicing for E2E Services Source: Strategy Analytics Slicing separates the network based on services; the reason to create a slice is to serve business purposes. With dynamic E2E network slicing, the industry will be able to move to a model where services can expand and contract their use of network resources as traffic demands. 1.1.2 How many slices will be needed in a typical network? Some slices will meet the needs of broad horizontal markets; some will be assigned to specialized vertical markets; and some will be specific to a particular customer. For example: x A customer will be able to have its own slice, share a slice with other tenants, or have services running over multiple slices x End user equipment (UE) will eventually be able to attach separate application service flows to different slices at the same time from the same device, and applications could even trigger a switch between slices x A vertical industry may in the future contract for multiple slices to serve its use cases with different service quality and performance requirements that are guaranteed E2E with Service Level Agreements (SLAs) just as dedicated networks are today Service Providers Copyright © Strategy Analytics 2017 | www.strategyanalytics.com 6 of 19 Exhibit B. 5G Network Slices Running on a Common Underlying Multi-vendor and Multi-access Network Each slice is independently managed and addresses a particular use case Source: IEEE Communication s 0517 ‘Network Slicing for 5G with SDN/NFV: Concepts, Architectures, and Challenges’ The number of slices will depend on the diversity of customer service requirements and the service providers’ ability to guarantee E2E Quality of Service (QoS) with available physical resources and a good business case. Intel’s Dr. Geng Wu, Chief Technologist and Director of Wireless Standards and Advanced Technology, guides that beyond initial incorporation of standards around some limits on the number of slices—i.e. how many slices are supported per UE—the optimal number of slices will be based on implementation and deployment; and that over time industry will learn through an iterative process what works best. With dynamic slicing, the number of slices may even vary in real time as resources are spun up and spun down as needed. 1.1.3 What is the value proposition for services of dynamic end-to-end network slicing in 5G? 5G is the next generation platform for future innovation and a service enablement platform for engaging verticals and enhancing mobile broadband evolution for consumers. 5G is about business transformation and creating new business models. Who offers services, who uses services, what services are offered and how they are packaged will shift, as 5G enables new business models, and potentially new types of service providers. Network slicing is a mechanism for assigning network resources in different ways so that 5G can serve new purposes and adapt to specific needs that will in turn drive revenue opportunities. In 5G networks, dynamic E2E slicing is anticipated to enable: x Service agility to flexibly meet market demand and respond to competition, as pointed out by BT’s Maria Cuevas, Head of Mobile Core Network Research (in an RCR Webinar with Strategy Analytics) x Delivery of “just fit” as needed service requirements for most cost efficiency and enhanced performance for a “pay for what you need” economy, as noted by Caroline Chan, VP and GM, 5G Infrastructure Division, Network Platform Group, Intel, with an ability to spin up and down as required Service Providers Copyright © Strategy Analytics 2017 | www.strategyanalytics.com 7 of 19 x A new model of service onboarding and management (eventually with self-service) for large enterprise/verticals and MVNOs x Ability to optimize for price and performance for specific services x Enhanced security, with customization on specific encryption techniques, isolation x Ability to span administrative boundaries (e.g. network slice going between two operators for a national smart grid, or federated slicing for global reach of services) Exhibit C. Telstra Motivations for Network Slicing Source: Telstra, “Telstra: Network Slicing to tailor the network architecture per user segment,” Network Slicing Summit 2017, 5 Dec 2017. 1.1.4 Is network slicing really the key to new 5G revenue and justify network investments? As operators plan for 5G investments, a top consideration is how they will generate revenues and a return on their 5G Investment (RoI). Dynamic end-to-end (E2E) network slicing is the key to enable 5G business cases across multiple verticals. BT characterizes three types of revenue related opportunities it sees for operators from slicing: 1) Rapid deployment of new services without disrupting existing slices, in order to gain the agility to compete and meet market demands 2) Ability to support different operational models for service deployment with a range of different SLAs 3) Ability to support a growing range of customer types that will have mutually conflicting functional requirements; virtual slices can support these conflicting needs at the same time on the same infrastructure and optimize for these requirements “How do you know 5G will be successful? I don’t. The only way to do it is actually go in and learn,” says Intel’s Caroline Chan, highlighting learnings in trials with vertical enterprises and calling for the wireless industry to expand its ecosystem for 5G to work with enterprise customers on business case development. Service Providers Copyright © Strategy Analytics 2017 | www.strategyanalytics.com 8 of 19 In particular, network slicing will enable Network as a Service (NaaS), with ability to offer new MVNO or partner models for verticals and specific segments/use cases. In order for network slicing to deliver on its promise of being an effective tool to generate new revenues and profitability, there are mindset changes and business model challenges still to be worked out, notes BT’s Maria Cuevas. In parallel, Intel’s Caroline Chan says the industry will need to adjust how it does contracts in a new model of dynamic service slices. 1.2 Business Benefits beyond Revenue Generation: Slicing Promises Much More What business benefits beyond revenue growth can operators address with slicing? While much focus is being given to the ability to drive new service revenues with network slicing’s service-centric architecture, there are additional benefits to operators to be gained by implementing slicing on 5G networks. Some of these benefits will facilitate operations while others will improve the experience for the users. For example, network slicing is expected to: x Optimize traffic & load management x Simplify wholesale and MVNO provisioning x Facilitate critical 5G IoT, Connected Cars and Ultra-Reliable and Low-Latency Communications (URLLC) on the same network infrastructure x Guarantee customer experience x Enable seamless E2E fixed and mobile VPNs with bandwidth on demand for enterprise customers x Facilitate SLAs across new partner ecosystems x Enable the ability to dynamically move resources where needed for compute and storage for more efficient use of resources, combined with MEC and AI, as described by Intel’s Caroline Chan; and drive network efficiencies across the board through dynamic resource allocation to slices x Isolate complex issues into something manageable, by disaggregating infrastructure, implementation and management, as explained by Intel’s Dr. Geng Wu x Elastically adjust bandwidth, QoS, topology, etc., of assigned network slices based on using big data machine learning (ML) techniques to monitor behavior of user traffic on a given network slice, resulting in reduced cost for the tenant and increased network efficiency for the operator, as described by InterDigital’s Akbar Rahman “At the end of the day, we need to make sure that the costs of operating these multiple virtual networks doesn’t exceed the additional revenues we are expecting to get from those services” Maria Cuevas, BT Service Providers Copyright © Strategy Analytics 2017 | www.strategyanalytics.com 9 of 19 2. State of Pre-5G Network Slicing 2.1 Industry PoCs and Trials for Network Slicing Multiple service providers, vendors, standards development organizations (SDOs), research institutes and associations are working to make network slicing real for 5G. Technical trials, Proofs of Concept (PoC), R&D and business case development (e.g. for enterprise extranets or industry verticals) are providing hands on learning and establishing the value of network slicing. In advance of 5G, however, a number of the proposed features and functions of network slicing are already being tested on today’s LTE networks with 5G standards in mind. The large industry players are working hard with service provider partners and a selection of their recent network slicing trials are shown below. Exhibit D. Selected Network Slicing Demonstrations Source: Strategy Analytics In November 2017 another Next Generation initiative, Telecom Infra Project (TIP), formed a new E2E Network Slicing Project Group, chaired by BT and HPE, to identify, develop, demonstrate and trial use cases for network slicing in a multi-vendor, multi-domain and multi-operator context. NGMN, ETSI, 3GPP, TM Forum and 5G-PPPare among the industry organization working to co-ordinate these efforts and complete the network slicing Month/Yr CSP & Partner Vendor, Consortium Network Slicing Demonstration or Project Oct.2015 SK Telecom Ericsson Demonstrate 5G network slicing technology for Augmented Reality, Internet of Things and Enterprise solutions Nov. 2016 Deutsche Telekom Huawei Demonstrated E2E Slicing for 5G RAN Feb. 2017 SK Telecom, BMW Ericsson ‘First 5G Federated Global network slicing’ May 2017 NTT DOCOMO Ericsson Live demo of Network Slicing for Robotics May 2017 BT Huawei Research 5G Network Slicing for Live Event User Video & MWC 2018 May 2017 5G-PPP NORMA Presents E2E mobile network architecture for rapid implementation June 2017 5G-PPP MONARCH Diverse services, use cases, and applications in 5G July 2017 China 5G trials ZTE, Demonstrates network slicing, 19 Gbps speeds Sept. 2017 Telefónica Nokia evaluate 4.5G Pro, 4.9G technologies & Evolution to5G for massive MIMO, Cloud RAN, Multi-access Edge Computing and Network Slicing Oct. 2017 Verizon, Vendor Demos Ericsson, Nokia Network Slicing for SD-WAN VPNs demonstrated at SDN World Congress Nov 2017 BT, Univ. Bristol Nokia 5G Testbed for Urban Apps. Network Slicing 2018 TIM Torino incl. MONARCH Multiple Field Demonstrations Service Providers Copyright © Strategy Analytics 2017 | www.strategyanalytics.com 10 of 19 specifications. GSMA Future Networks programme is also working on the topic of network slicing business case development. Most of the trials listed above are testing relatively static slices with pre-assigned applications per slice but working on mechanisms that allow the network to monitor and dynamically optimize the slice performance to ensure that service providers can guarantee SLAs with ‘network elastic’ slices. Since TCP/IP guarantees only ‘Best Efforts’ and has no flow management, two of the major vendors are providing their own internal flow management so that multiple service flows can share a slice to lower costs below those of a ‘nailed up’ VPN or MPLS tunnel. 2.2 Service Provider Examples Some of the most interesting demonstrations of network slicing to date have been for global remote Connected Cars, Software Defined Multi-Data Center connectivity and High Performance Secure Enterprise VPNs. Many of these were described by Strategy Analytics in the October 2017 Webinar, “Analyst Angle Webinar: Network Slicing: The Key that Unlocks Revenue Potential”. Verizon, for instance is focused on Software Defined Networking (SDN) for network slicing that supports slices for a variety of diverse use cases from smartphones to autonomous driving and massive IoT as shown in the exhibit below. Exhibit E. Verizon SDN Controlled Network Slicing for Diverse Slices Source: Verizon SDN-NFV Reference Architecture 2016 Much of the latest focus, however, has actually been on the essential operational capabilities that are needed to ensure performance and develop management and network and service orchestration mechanisms for these diverse services. For example, the 5G-PPP sponsored Mobile Network Architecture (MONARCH) trial that started in August 2017 and which will run through mid-2019 has a “specific technical goal …to use network slicing (to) capitalize on the Service Providers Copyright © Strategy Analytics 2017 | www.strategyanalytics.com 11 of 19 capabilities of SDN and NFV with orchestration of access network and core network functions, and analytics, to support a variety of (diverse) use cases in vertical industries such as automotive, healthcare, and media.” Partners include: Deutsche Telekom, Telecom Italia, Nokia Bell Labs France, Huawei Technologies and Samsung Electronics. There are several testbeds including Hamburg which will demonstrate a Smart Sea Port with Traffic Light Control, Video Surveillance and Sensor based mMTC for barges and wireless terminals. The Venice trial will demonstrate Tourist City capabilities for Virtual Reality and Immersive, Co-operative Media. See the Exhibit below. Exhibit F. 5G MONARCH: Orchestration and Inter-Network Slice Control Source: 5G-PPP 5G MoNArch presentation, Brussels, June 1st, 2017 These demonstrations and trials should ensure not only that the necessary technology is developed for commercial deployment in the next couple years, but also that there are proven and profitable business use cases for both service providers and their customers. Service Providers Copyright © Strategy Analytics 2017 | www.strategyanalytics.com 12 of 19 In a recent study with BT, Ericsson attempted to estimate some of the financial benefits that 5G network slicing could provide for operators. Exhibit G. Ericsson Study Shows Cost Savings from Network Slicing Source: Ericsson Study: How Network Slicing Pays Off Sept 20, 2017 The study shows that network slicing enables new revenue generation, and lower OPEX and greater CAPEX efficiency, resulting in significantly increased incremental contribution to the bottom line through new service launches. Network slicing, with cost-effective deployment of operational automation, will become the most economical way to manage service scalability. Ericsson notes that “the economic benefits are seen even with a small number of service launches. Benefits then increase with the scale of services added thereafter.” Service Providers Copyright © Strategy Analytics 2017 | www.strategyanalytics.com 13 of 19 3. Technical and Operational Challenges to Fulfil the Promise of Network Slicing While some practical implementations of network slicing—such as fixed and mobile enterprise VPNs with E2E SLAs—can be offered in the near future, there are some significant barriers to the full deployment of dynamic network slices for many demanding classes of low latency or high volume service. Some serious technical problems for network slicing remain that will require additional research. Many others have no simple traditional solutions. These translate to some fundamental challenges for network slicing that include: x How to guarantee Quality of Service (QoS) with a high degree of certainty – Network slicing is all about matching the right Class and Quality of Service or QoS to every application—for example, real time two-way video and scheduled file downloads would be assigned to different slices that meet different parameters i.e. different latency, bit loss, throughput, etc. If network slices and E2E QoS guarantees can only be delivered over fixed VPNs or MPLS tunnels with dedicated physical resources they just become silos of ‘nailed up’ assets that cannot be allocated dynamically—undermining the value of the dynamically shared NFV network. x Performance issues in a shared infrastructure – Problems of resource overprovisioning are likely to occur if there is ‘hard partitioning’ of network slices, but if slices share resources then new mechanisms and policies are needed to avoid contention and ensure QoS for each slice. x Inherent contradiction between ‘nailing up’ VPN resources to guarantee SLAs for network slicing vs. true NFV virtualization – If ‘hard partitioning’ means that network resources can only be virtualized within a slice a major NFV benefit of maximizing capacity utilization with the dynamic allocation of all network resources from a ‘virtualized network pool’ could be severely reduced. x Management and orchestration issues – Given the dynamism and scalability that slicing brings, management and orchestration in multiservice flow scenarios are not straightforward. Slices need resources to be assigned ‘on the fly’ and resource demands may vary dramatically in very short time intervals, both within and across slices. x End-to-End services vary in ‘scope’ of a slice – Many descriptions of network slicing assume that the scope of a slice must always go across the entire network from a user application to a server in the heart of a fixed network or another user on the other end. But in fact we are now in a world where some services may stay within the Radio Access Network (RAN) while others may go directly between data centers in the core. Still others may move dynamically around the Telco Cloud as required. So E2E requirements will vary widely in scope and complexity. Service Providers Copyright © Strategy Analytics 2017 | www.strategyanalytics.com 14 of 19 x Business models must become diverse and flexible to match the services – The allocation of network resources per flow/slice can become highly dynamic and the business models for pricing etc. may sometimes need to match the dynamic traffic variations and even SDN controlled bandwidth allocations. Other prices may, however, not even be based on traditional throughput or usage metrics. Instead CSPs may be able to charge for QoS delivered or the value of low latency of high performance results. Key technical problems for network slicing for which solutions are still in process include: x How to guarantee QoS in a packet queuing environment where even DiffServ can only guarantee ‘best efforts’ x Building blocks that need to be completed – Dynamic VNF flows and configurable service chains – E2E service orchestration – Tools for automated creation, activation and management – Slicing the RAN – Optimizing edge computing And some critical questions remain that must be answered if network slicing is to fulfil its potential: x How do we characterize application/service flow requirements to the network in real time? x What parameters do we use? Latency? Bandwidth? Burstiness/Variability? x How do we assign incoming service flows dynamically to slices? x How do CSPs switch application/service flows between slices? x What is the role of TOSCA templates for slicing in the Telco Cloud? x What is the impact of ‘Slicing the RAN’ and adding MEC Services at the Edge? x How many slices do we need? Service Providers Copyright © Strategy Analytics 2017 | www.strategyanalytics.com 15 of 19 4. A Call to Action and Key Questions to Assess 4.1 A Call to Action Significant Progress on Network Slicing Requirements but new Approaches and Standards Needed What should operators and vendors do in 2018 to prepare for network slicing as they move toward commercial 5G deployments? x Increase enterprise and vertical engagement and active participation in the 5G ecosystem: further collaboration with enterprises and verticals is needed to support joint development of requirements for slicing and business cases that drive value to service providers and their customers x Learn through doing: As Intel’s Caroline Chan advises, learning through doing in trials is a crucial process for developing 5G network slicing; incorporating learnings back into R&D and standards and further trials in an iterative and collaborative process will further address both business and technical challenges as the industry moves toward commercial 5G deployments x Work on process and organizational changes that are needed to implement 5G network slicing: in addition to the technical and operational challenges, operators face challenges to transform processes and even mindsets and company culture to prepare for 5G and be ready to use slicing as a revenue generation and cost efficiency tool: e.g. contract processes will need to change. BT notes every part of the value chain must be much faster than today for agility across the service lifecycle, and partnerships will require commercial agreements with well- defined SLAs and ability for slices to work across multiple administrative domains. x Develop common definitions of slices and their parameters across operators: BT’s Maria Cuevas recommends a template to describe slices. As Akbar Rahman of InterDigital explains, operators will need a way to advertise the APIs for network slices. BT sees the GSMA as having a critical role in developing these common definitions and the operator is working on this effort with the GSMA. x Work on incorporating machine learning, analytics and AI into the development of network slicing and use case trials as much as possible, to aid in automation, fault prediction and self-healing, as well as improved experience for the services and tenants on slices. Service Providers Copyright © Strategy Analytics 2017 | www.strategyanalytics.com 16 of 19 4.2 Key Questions Collaborate on addressing key questions: x How best to slice for cost efficiency while maximizing end user value and enabling value based pricing? x How to optimize overall network performance and network scalability alongside network slicing? x How to reduce the complexity of network slicing through automation and orchestration? x How to ensure that dynamic slicing will drive the envisioned capex/opex savings through efficiently shared resources and deliver elastic scaling based on demand? Service Providers Copyright © Strategy Analytics 2017 | www.strategyanalytics.com 17 of 19 5. About the Sponsors 5.1 5G End-to-End: What Intel Brings to the Table for Dynamic Slicing In 5G, Intel is focused end-to-end, playing an important role of trusted advisor, technology partner and ecosystem builder. As Sandra Rivera of Intel said, while 5G is the fifth generation of RAN, it is the first generation of fully distributed compute power in the network—and Intel is bringing its expertise in the IT network world to bear in developing and supporting 5G as a distributed computing network. Intel is active in standardization activities, such as the service architecture group in 3GPP and ETSI MEC task group (Multi-Edge Compute impacts service delivery enablement for slices), and open source development, for example in the Telecom Infra Project (TIP). Intel’s 5G related products and solutions span from chipsets and device partnerships, IoT and enterprise groups, autonomous vehicles, cloud services and data centers, to AI and machine learning, among others. On the network side, Intel is very active on NFV resource allocation, network and service orchestration, assurance—all critical items to NFV that are also very much central for network slicing to function. In addition, with its 5G trial platform, Intel is involved in numerous trials around the globe, providing 5G reference architecture for proof of concept with customers, and activities pulling in participants from vertical industries to develop business cases and requirements for 5G services and network slicing. For additional insights from Intel on 5G Network Slicing ecosystem challenges and building collaboration for business case development and standards, see the video interviews conducted by Strategy Analytics’ Susan Welsh de Grimaldo on RCR Wireless website: x Video interview with Dr. Geng Wu https://www.rcrwireless.com/20171024/wireless/analyst-angle-video- interview-intels-dr-geng-wu-5g-network-slicing x Video interview with Caroline Chan https://www.rcrwireless.com/20171024/wireless/analyst-angle-video- interview-intels-caroline-chan-5g-network-slicing “The new set of challenges and also the opportunity is how you actually transform the network with technology to serve the many new sets of applications, new industries and actually enable the next round of innovation.” Dr. Geng Wu, Intel “For 5G, you have to expand your ecosystem…start talking to folks you don’t normally talk to, you understand who actually pays the bill, who is willing to adopt your technology. So be willing to try, expand your horizon, and all this is possible because the underlying network is much more flexible and soft.” Caroline Chan, Intel Service Providers Copyright © Strategy Analytics 2017 | www.strategyanalytics.com 18 of 19 5.2 InterDigital: Developing Key Standards, Building Blocks for 5G Network Slicing As a technology company focused on developing intellectual property, InterDigital is active in standards development organizations (SDOs) working on defining 5G and coordination among SDOs. InterDigital’s Akbar Rahman, Sr. Principal Engineer, shared his insights on work taking place at the Internet Engineering Task Force (IETF) Standards body to determine what needs to be developed into standards for internet protocols to support 5G network slicing and related precursor activities. At IETF, 5G Network Slicing is currently a hot topic and IETF is actively coordinating with 3GPP for IP infrastructure requirements to support Network Slicing. IETF has recently kicked off a pre-Working Group effort to identify what needs to be standardized to support 5G Network Slicing. While the group has not yet reached consensus, several areas to potentially include have been identified: x network topology data models (e.g. YANG) x protocol encapsulation x signalling to connect subnet slices x performance measurement, traffic engineering, etc. – https://datatracker.ietf.org/group/netslicing/meetings/ Collaborative Research & Development on key elements supporting 5G network slicing: In addition to its work at SDOs, InterDigital is involved in a number of collaborative R&D efforts that are tackling elements that feed into network slicing. For example, many of the EU funded projects related to 5G are providing key designs for network slicing using NFV/SDN building blocks. InterDigital is active in numerous EU funded projects including two key projects related to network slicing: 5G PPP project – CROSSHAUL Developing a virtualized high speed (sliceable) backhaul and front-haul network to connect a large number of 5G Base Stations to the Mobile Core Network. https://5g-ppp.eu/xhaul/ H2020 project – POINT Developing a virtualized underlay network fabric (sliceable) to run IP based services that provide superior performance by name base routing, fast indirection, intrinsic multicast support, etc. https://www.point-h2020.eu/ To support dynamic slicing, “some business relationship has to be available…the operator might have the most dynamic network slicing system available, but if they have no way to advertise the APIs, no way to charge for it…I believe the mobile operators will start becoming like Amazon or Google where they offer APIs and basically a credit card or some other electronic charging system… ” Akbar Rahman, InterDigital Service Providers Copyright © Strategy Analytics 2017 | www.strategyanalytics.com 19 of 19 6. How Can We Help You? Strategy Analytics provides strategic and tactical support to global clients through a range of customized solutions: • Multi-Country primary research assignments using leading edge tools and techniques • User Experience Design and Innovation engagements • Real Time Mobile Consumer On-Device Tracking projects • B2B Consulting Projects and Whitepapers Please contact us at Custom@strategyanalytics.com with any questions and for further details on how we can work with you to create a custom solution that addresses your specific needs.